Arbiter Software, a Woodbury, MN company offering Lifecycle Management for Workload Automation AE (AutoSys) is pleased to announce its ACCE 2.5 release. 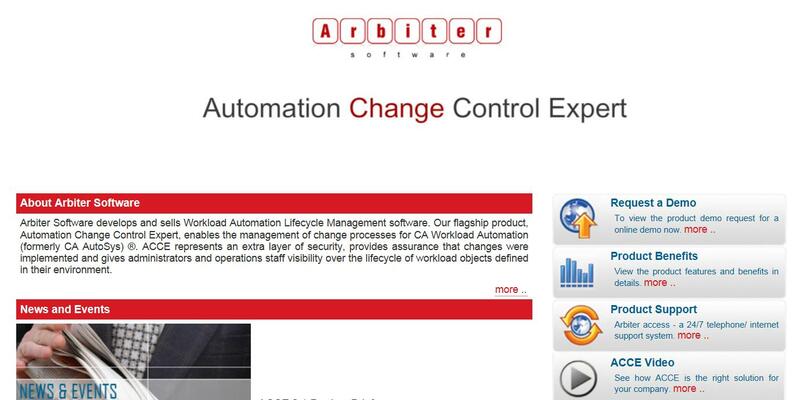 Automation Change Control Expert (ACCE) is Arbiter Software’s flagship product providing AutoSys users the ability to manage all changes to job definitions and automate their migration through the entire AutoSys landscape. ACCE 2.5 leverages the entire web browser resulting in a more intuitive, user friendly interface. More space means less clicks for our users. This new interface ensures promotion of change is done more efficiently and accurately. ACCE 2.5 has another improvement to our industry leading validation process with the ability to warn or enforce best practices prior to submitting change requests. If a validation is important but not necessary, simply check the warn box on the validation and ACCE will bring the warning to the attention of the requestor. The enforce option ensures that before any change is submitted, the best practices selected must be adhered to. Finally, ACCE 2.5 now features our integration API, which enables enterprise help desk systems such as CA Service Now, Service Desk, etc. to open/close, initiate, and receive status from ACCE change workflows. This integration enables our clients to use ACCE to ensure accuracy of changes while capturing important audit information from an enterprise level via their help desk solution. To find out more visit our website at http://www.arbitersoftware.com. Schedule a demo today.